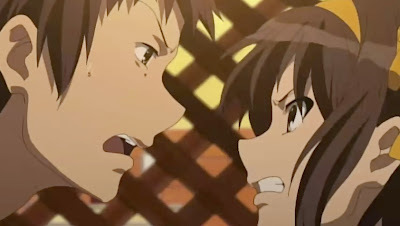 I Blog Anime: The Melancholy of Haruhi Suzumiya 2009: What?! Seriously?! Eight episodes of agonies just for that?! I hope whoever wrote and produced this series is fired and never allowed to make animes again. All in all, at least we're done with this ridiculous nonsense for now. Let's hope the rest of the series is as brilliant as the original, not like the garbage we just went through. It was a total relief that the Endless Eight was over and i was depressed over the sad ending. I think every one excepted a grand finale, a better reason to stop the time loops than the current one. A good finale would be the one koizumi said. About the part of the producer never making animes again, you must do that, just place him under heavy survailance, like right NOW. As the series stil goes on, i hope for VERY good episodes that can make up for those boring eight ones. Animenewsnetwork.com says there're 28 episodes in this new series. But I read somewhere online that the original 28 episode list contained only one episode called "Endless August". So with the "Endless August" expanding to eight episodes, the total episode count would come out to be 35. We still have quite a long way to go with the series. in this case, it was far too faithful to the book, 3 episodes max for this, it stunk for me because I already knew how to solve it so every time it would get to that part I would end up yelling at the tv. The book doesn't have 8 repeating chapters, does it? I dont remember which book, but I think the chapter repeats 3 or 4 times, although there is a bit more variety to them than the anime (not in what they do, but in what is talked about and described in detail each cycle, so that its not so repetitive.) although even then it was lame. I actually read the novel, and in it the story doesn't repeat at all. Everything in the story happens in the same 2 week period. The endless eight if you look into it were actually part of the published series and were inserted into the whole show as it played in-between episodes not in a row like most of them show. So, if you watch the series, don't watch all 8 in a row, inserted them randomly into the show if you want.